For many of us, daily exercise poses little more risk to our overall safety than few minutes of flush or rapid heartbeat. But for the see-through Ancylomenes pedersoni, or Pederson's cleaner shrimp, their physiological response to exercise could be deadly. Under normal conditions, the body of a Pederson's cleaner shrimp is so clear that you can read through it. This clarity makes it easy for them to blend into the complex background of a coral reef to avoid being eaten. However, new research by Ph.D. student Laura Bagge of Duke University is showing that exercise can instantly change their complexion from clear to opaque. As few as three simple tail flips, used to evade capture, can ruin their transparent camouflage for hours and make them vulnerable to attack from predators. But how does exercise disrupt the shrimp's camouflage, erasing its transparency? "Transparency is not just the absence of pigment, it's a harder problem than that, related to light scattering," says Bagge. See-through camouflage is achievable by a marine animal if it can become as much like a sac of water as possible. In fact, transparency is a common and highly effective camouflage strategy for animals where there is nowhere to hide except in plain sight. For an eye to see an object, light must bounce off the object and hit the photoreceptors of the eye. When something is transparent, like a pane of glass, the light bounces so little that an eye sees through the object to whatever lies behind it, making it relatively invisible to the eye. Transparent marine animals blend into the surrounding water in this way, allowing light to pass through their bodies to gain a transparent camouflage. How does an animal let the light pass through the body? Transparent animals rely on a few tricks of light. Light bounces at interfaces between materials with different densities, or refractive indices. Drinking water appears clear because it has essentially one refractive index. However, when water freezes, tiny air bubbles and other impurities in the ice cube cause light to bounce in random directions, turning the ice opaque. In practice, we think that transparent animals most often reduce interfaces that scatter light by becoming, small, thin, or embracing a blob-like existence, adrift in the ocean. But Pederson's cleaner shrimp are different than most other transparent marine animals. Instead of floating about, these shrimp work hard for a living as fish cleaners, forming symbiotic relationships with a few species of anemones that inhabit shallow water coral reefs. Other cleaner shrimp relatives who tend to live with only one species of host anemone have evolved color patterns to blend in with their host. Not so with Pederson's cleaner shrimp—aside from flashy antennae and legs that might function to advertise their cleaning services, the bodies of Pederson's cleaner shrimp are almost completely see-through. For these reasons alone, Bagge and her colleagues were interested in these shrimp. However, when she brought them into the lab, Bagge quickly noticed something peculiar—the bodies of the shrimp went from transparent to an opaque white color in as few as three tail flips, which the shrimp use for escape. The more tail flips they performed, the more cloudy their bodies became. This was a fleeting effect, and after a few hours their transparency returned. Bagge excitedly dug into the question of how exercise could turn these clear shrimp cloudy. But she could find few other studies that looked at how animals lose their transparent camouflage. For example, a diver in the 1960's (invertebrate zoologist extraordinaire Dr. G. O. Mackie) startled a jellyfish relative called a siphonophore, which promptly turned white. Based on the presence of dense circular granules in SEM microscope images of the mesoglea, Mackie thought that an altered pH may cause proteins to precipitate, or to come out of solution. Bagge thought that maybe this could explain why her shrimp turned opaque, but when she looked at cross sections of their bodies using a scanning electron microscope, she did not find anything like the granules Mackie saw. In fact, there was nothing there that would cause the light scattering and opacity that she witnessed in the see-through shrimp. Bagge was left wondering what else changes during exercise that could cause an increase of scattering inside the shrimp. She thought back to the physics of light scattering, looking for other options. Here, Bagge found her hypothesis: changes in blood flow following exercise could change the volume of blood between muscle fibers, causing more light to scatter and the shrimp to turn opaque. During escape maneuvers, the big sets of muscles used for the rapid tail flips use up oxygen, which needs to be replenished by blood flow. Although many people mistakenly think that arthropods have "open" circulatory systems with few vessels, Bagge found that fluorescent blood flow tracers injected into the shrimp illuminated a complex network of blood vessels all throughout the body. When she examined microscope images of injected animals that had exercised and compared them to those that were allowed to sit quietly, she saw that exercise had changed the shrimps' physiology. Instead of only seeing blood flowing through the large blood vessels in the transparent bodies of resting shrimp, Bagge also saw blood filling the spaces surrounding individual muscle fibers, presumably traveling through smaller vessels that opened up during exercise. To Bagge, this suggests that the increased blood flow between muscle fibers creates more interfaces that scatter light, and ultimately causes the see-through bodies of the shrimp to become opaque and visible. In another experiment, Bagge gave the shrimp small wounds, which caused blood to pool at the wound sites. The wound sites turned opaque, while the rest of the animal remained transparent, supporting the explanation that changes in blood flow to muscles disrupt the shrimps' transparent camouflage. "It's taken for granted that see-through animals are transparent all the time, but that's actually not the case. In these complex animals that are full of muscle, transparency can be disrupted and my study gets at one cause of that disruption," said Bagge. 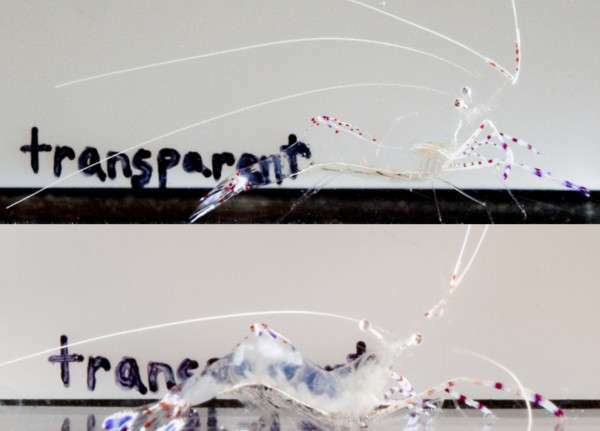 Now that Bagge and her colleagues have a strong working hypothesis as to why the shrimp become cloudy, they're wondering what the shrimp may have to give up to be transparent, and how extensive this phenomenon of disrupted transparent camouflage may be in see-through animals. Given the dearth of information about loss of transparency, understanding what animals lose in becoming transparent will be key to understanding how, and when, transparency can evolve. Bagge presented her research at the 2016 annual conference of the Society of Integrative and Comparative Biology in Portland, Oregon.